Successfully Added Hand Held LCD Digital Contact Tachometer - Range From 0.5 To 19999 RPM, Backlit LCD Display to your Shopping Cart. 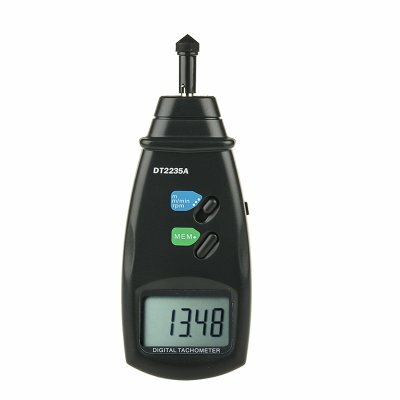 coming in a protective carry case to keep it free from grime and dirt digital tachometer runs on 4 AA 1.5V batteries and lets you record data in its memory for easy comparisons of different readings. With a quartz crystal time base this precision toll is accurate to within less than 0.1% and has a large measuring range from 0.5 to 19999 RPM. With different fittings it can be used for contact or rotational speed measurements and is the perfect accessory for your tool box. . This Hand Held LCD Digital Contact Tachometer comes with a 12 months warranty. Brought to you by the leader in electronic devices as well as wholesale cool gadgets, Chinavasion..